Have you suffered a broken wrist, due to an accident that wasn’t your fault? Then you may be able to claim compensation for your injuries. Legal Expert can help you if your injuries left you with a broken wrist, injured wrist or wrist fractures. If your accident was caused by the negligence of another party then you could be entitled to claim compensation. It could have been in a public place like a hotel or shop, an accident at work or a road traffic accident. And what’s more, you could be owed thousands of pounds for a broken wrist. We are Legal Expert, we are a trusted legal advisory service, who work with some of the UK’s best personal injury solicitors. We can match you with an expert personal injury solicitor who can help you make a broken wrist accident claim. Call Legal Expert now on 0800 073 8804, for a free consultation with one of our understanding advisors. During your consultation, we can judge whether or not you have a valid case and can advise you on how much compensation you could win. Then, you will be matched with a personal injury solicitor with the right expertise to handle your case, at no extra cost to you. So don’t delay, call Legal Expert now on 0800 073 8804 to begin your injured wrist accident claim. In this case study, we will look at the case of Mrs S. Mrs S, as we will refer to her here for privacy reasons, is a grandmother in her 50s who works as a clerical officer. The accident occurred one morning when Mrs S was on holiday with her extended family, including her grandchildren. She walked on a marble floor in her hotel, which she described as “awash with water” and “literally as if someone had thrown a bucket of water on the floor”. Mrs S had walked on the same floor not long before and it had been dry, gone outside and the floor had been wet by a cleaner with the intention of mopping the floors. The cleaner was not present at the time that Mrs S returned. The wet floor was not signposted, and there was nothing else to indicate the potential hazard of the wet floor, which being marble, was even more of a hazard as the surface had no natural grip. Mrs S slipped on the wet floor and fell heavily on the wet floor. After her fall, Mrs S saw a doctor, who thought that her wrist might be sprained. It was strapped and the doctor told her to rest. For the rest of the holiday, Mrs S found herself in severe pain and had to take painkillers to sleep. She was also unable to perform activities such as cutting up food, squeezing a suncream bottle or swimming with her grandchildren in the hotel pool, which greatly impacted her quality of life and enjoyment of her holiday. After Mrs S returned home to the UK, she went to her local A&E department where she was diagnosed as having a soft tissue damage and a possible fractured wrist. A later MRI scan revealed that she had also severed a tendon on her thumb. A broken wrist, fractured wrist or injured wrist can cause severe pain and tenderness, bruising and swelling and cause difficulties in movement. It is usually treated by putting the wrist in plaster and sometimes giving the patient a sling, to keep the arm raised. More serious broken wrist and wrist fractures are treated by the doctor realigning the bone manually or with surgery. The NHS has a helpful guide to a broken arm or other wrist injuries. Mrs S’s legal team attempted to claim compensation from the tour operator (the Defendant), on the grounds that they created a hazard by not signposting the wet floor. After Mrs S’s accident, the hotel put mats down on the floor of their entrance area, presumably to stop further slips, trips and falls. However, despite what seems like an admission of liability on the part of the Defendant the tour operator was very uncooperative in its response to Mrs S’s legal team, refusing to respond to correspondence, then passing them on to different legal teams. After a three year ordeal to settle Mrs S’s wrist injury claim, her solicitor negotiated a £8,500 compensation payout for her. One downside of claiming personal injury compensation for a broken wrist, injured wrist or fractured wrist is that some solicitors require you to pay an upfront fee. 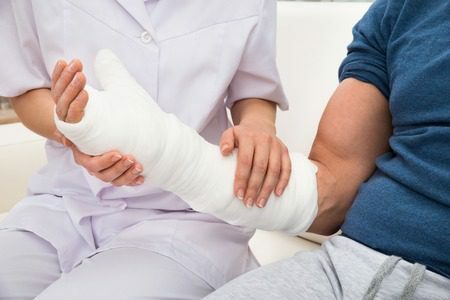 Broken wrist recovery can be a painful process, causing you additional stress and what’s more, it often means that you are unable to work during that time, especially if you do a manual job. Therefore you may be reluctant to pay an upfront fee. That’s why Legal Expert works with solicitors that offer a Conditional Fee Agreement (CFA), which is also known as a No Win No Fee service. With a no win no fee solicitor, you will only have to pay the fee, if your case is successful. This is a less stressful option for many, as you don’t have to take any financial risk when making your claim. Call us, Legal Expert now on 0800 073 8804, to speak to one of our friendly advisors about making a no win, about using a no win no fee solicitor for your wrist injury claim. If you have been injured in an accident that wasn’t your fault, then you may be able to claim compensation, whether the wrist injury you suffered was a broken wrist or a fractured wrist, as long as you can prove that the accident was caused by negligence, on someone else’s part. You may also be able to claim compensation for loss of income, if you had to take time off work during your broken wrist recovery, or recovering from wrist fractures. Call Legal Expert today for your free consultation to see if you have a valid case and hear how much personal injury compensation you could claim. Call us today on 0800 073 8804, our advisors are waiting to hear from you. An NHS Guide to broken arm and wrist injuries, including how to treat them. How Much Compensation For Slipping on a Wet Floor Claim? Help and advice for claimants involved in a slip, trip or fall accident caused by a wet floor. If you wish to claim for slipping on a wet floor, then we can help you.